I made a decision to tackle the bulk of films out there adapted from HP Lovecraft’s work. Why, you ask? 1, because Lovecraft is one of my favourite authors. He created a far-reaching fictional universe that started an entirely new genre of horror. Many only know of Cthulhu, and many don’t even know that part. I’d like to shed a little light in that darkness. And 2, think of it as my tantrum or protest of sorts that Mountains of Madness has stillnever been made into a major movie. Bring on the Elder Things, dammit! 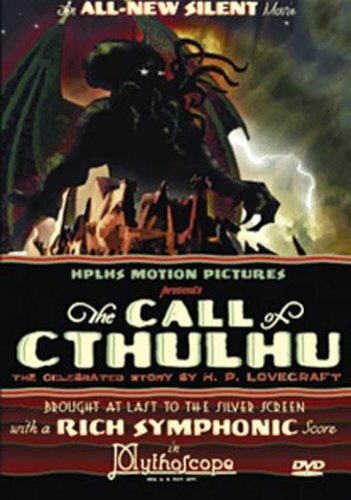 I’ll start off by stating that I absolutely wish, that secondary only to Mountains of Madness, Call of Cthulhu is the other major Lovecraft fiction should be made into a major Hollywood film. With a noir-ish detective mystery involving cults, murder and mysterious islands, CoC would make a great flick. In the absence of such, this short film fills the gap nicely. Obviously the HPLHS worked with no budget, but because it is a recreation of silent-era filmmaking, that works very effectively. The cinematography elicits a moody sense of eerie mystery, and then plenty of intentionally (i think) cheesy moments that certainly shocked viewers back in the day. This is a silent film, so no dialogue, and is accompanied by a great symphony score. It really feels like going back in time and seeing this film at an old picture-house. Although some might find it silly, I definitely see the love that was put into this project by a dedicated fanbase that didn’t have a ton of resources at hand, but did a great job with what they could. I have a lot of respect for that.